Trinity Congregational Church was founded in 1828 by a group of five people, four women and one man. The foundation stone was laid on September 23rd, 1828 and the building opened for worship in the following July. The design is a Georgian preaching box with a Doric porch. The architect was Raymond Wilshire, a pupil of Charles Barry, who designed the Houses of Parliament. When first built, Trinity was known as the 'chapel among the trees'. The chapel is elevated several steps above the street level. The builders in the early 19th century must have known of the proximity of the River Effra, now channelled underground for most of its length. Our church began life then in the early 19th century when London, visible across the fields, was overflowing to the Surrey suburbs, before the coming of the railways. As stated, the chapel was founded in 1828 by five people – four women and one man – moved as they believed by the Holy Spirit, and only later did they call a minister. The original Georgian building is still used for all our services and it is officially conserved (grade 2). In the Victorian period the chapel was normally full, even upstairs in the spacious gallery, but Trinity was then only of modest importance by the standards of the day. Several young men from here were killed in the First World War, after which the congregation declined slowly with the doubt and self-questioning, resultant on the carnage and mutilation which destroyed that generation. The church, however, was always known as the church with a welcome, and we have tried to maintain that attitude and fine reputation. London is a cosmopolitan city and we have received members from many countries. Needless to say, all are welcome here. Our spirits are buoyant and our fellowship strong. 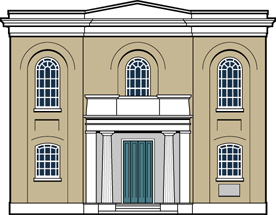 Trinity Congregational Church, Brixton, is a group of gathered Christians who confess faith in Jesus Christ as Saviour and Lord. The chapel, a grade two listed building, has stood here since 1828. This is a much-loved place which has been a spiritual home to many people over the generations. As a Congregational church we believe in the priesthood of all believers and are an autonomous body (independent of outside control from synod, bishop or other ecclesiastical authority.) We come here to worship God and to meet with one another. The life of the church revolves around the Sunday worship which takes a variety of forms; our minister preaches about four times each month and other services are led by members or by visiting friends. Services range from the structured to the very informal. We also meet weekly for bible study and hold regular church meetings of our members where matters of importance to the life of the church are discussed and decisions made by consensus. Baptisms, marriages and funerals, of course, also occur in our church. What happens here, we hope and pray, is guided by the Holy Spirit. It is also true that the fellowship at any particular time is defined by the unique and willing contribution of each member. We have enjoyed meals together, discussions, arguments, study and classes, choral singing, musical performances, games and excursions, all activities which the members and friends at the time want to organise and take part in. We like to think we are open and welcoming and that we provide a place where people can find God, to explore some of the deeper questions of life and also make friends. We welcome initiatives and would be happy for our buildings to be used in diverse ways – for music, arts, culture, education and so on. Above all we believe we are on a journey, in which we constantly engage with that ongoing process all human beings have to face in some way or other: how can I love my neighbour and enable him or her to love me? First and foremost, Congregationalists are Christians. We believe in God who created us, in His Son, Jesus Christ who saves us, and in the Holy Spirit who guides and inspires us. We take our authority and inspiration from the bible. We worship as a gathered church, a group of Christians meeting together to pray, read and hear the scriptures, study and reflect on the Christian message and to sing our praises. We hope to find fulfilment in living a Christian life of fellowship and service. As Congregationalists we are making an important statement about church order. We belong to the Independent tradition which in England and Wales dates back to the mid-sixteenth century but some would say describes how the early Christians in the first century related to one another. This means we are without a hierarchy, operating without bishops, synods, or outside committees imposing their authority. All are welcome at our services, young and old from all nations. We are open to hear the views of others. Those wishing to share in decision making and in taking responsibility for the church's life become 'church members' and do so by profession of faith in Jesus Christ as Saviour and Lord. However, we do not sign up to a written creed. Members promise to meet together regularly, to study the bible and pray and to give as appropriate of time, resources and money to contribute to the life of the church. In the church meeting, members are jointly responsible for taking decisions affecting the life and work of the church, we believe by seeking the mind of Christ. We regularly administer the sacraments of the Lord's Supper and Baptism. Marriages and funerals are held by appointment with the minister. Congregationalism is also known as Independency. It is a system of church government, arising out of the Protestant Reformation, whereby the members of each local church, male and female, have full responsibility for their own affairs, without control from outside. This system derives from the New Testament and, although Congregationalists have never been a large body, they have produced influential figures like John Milton, John Bunyan, Isaac Watts, Philip Doddridge, David Livingstone, John Howard (the prison reformer), Robert and Elizabeth Barrett Browning, Eric Liddell (of Chariots of Fire), Mervyn Peake (the novelist) and many other notables. Trinity Forum offers an opportunity to explore issues of interest to Christians and others in exploring topics of contemporary interest. A variety of invited speakers introduce their subject and lively questions and answers follow. Why 1662? The Act of Uniformity 1662 effectively created dissenters or Nonconformists of all those who did not use the Anglican Book of Common Prayer for their worship. As a result approximately 2,000 ministers were forcibly ejected from their livings. We are Nonconformists ourselves, hence from the free church tradition, but we welcome all - those from other church traditions and those from none. We hold meetings each month, from October to June, at which we invite speakers to talk on a variety of subjects of interest to Christians. Our topics range from history, theology and art to missions, social action and charities. We always have a lively discussion, with a free exchange of questions and answers. All are welcome. The meetings are held at 7.30 pm usually on the first Tuesday evening of the month, some of them at Trinity Congregational Church, St Matthew's Road, Brixton. Supper is at 7pm.